Member of the Berjanni royal family. Third in line to the throne.Prominent relatives serving in Starfleet include cousins, Captain Liteyo and Lieutenant Liteha. Parents deceased with no known siblings. Dark straight hair, silvery eyes, fair complexion, hunchbacked, average height and build. Racial abilities : The Berjan homeworld is circled by four moons, three in constant orbit, while one in synchronous cross-spins. Such immense and turbulent centrifugal stress results in pulls about thrice the gravity of Earth. If a Berjanni continuously spends his/her youth until their late teens on the planet, their bodies would develop heightened physical attributes while on other planets. Although a Berjanni may leave the planet’s influence after reaching adulthood, the attributes remain permanent. The Berjanni have improved strength, dexterity and constitution. However, the adverse gravitational pressure would have shaped a somewhat unsightly hunch near the shoulders which cannot be medically corrected. In addition, the sense of pain is greatly diminished, only a sore throbbing would be felt in place of pain. A Berjanni becomes very clumsy and unwieldy when under conditions of zero-G weightlessness. Escaflowne has a towering presence but remains a silent enigma. Formality and piety are important aspects of a Berjanni’s life as very much his. He is however, open to casual jesting, assessing situations in a twisted sense of irony and humor. Formality and piety are important aspects of a royal Berjanni’s life. Fencing. All members of the royal family are expert exponents in the art of sword fighting as part of their ancient tradition. Escaflowne favours the sabre. One of the very few Berjannis to serve in Starfleet, since only members of the royal family are permited to serve in foreign extraterrestrial organisations. The most famous being Captain Liteyo of the USS Prometheus-A, the first crown prince, who survived Borg assimilation. Royalty allowed Escaflowne a privileged upbringing. However, Escaflowne and Liteyo both shared a common simple youth, choosing to live outside the constraints of royal life and using their intelligence for all sorts of mischief. In exasperation, the King sent both of them to live with the Berjanni ambassador on Earth, to learn as much as possible about Federation culture to prepare Berjan’s eventual membership. However, both spent most of their time gallivanting on adventures which included recovering stolen cybernetic technology from the S’ona and saving the Andorian ambassador’s daughter from Nausican kidnappers. Liteyo being older, joined Starfleet first which Escaflowne eventually followed. Both performed very well mostly in the academic fields, inventing many useful creations as well as annoying tools of mischief. Royalty only have single names. 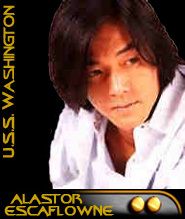 But Escaflowne decided to adopt a first name, Alastor, to honor his favourite professor at the Academy and though it would help blend into Federation society much easier. Upon graduation, Liteyo was assigned to deep space exploration at the edge of the Delta Quadrant while Escaflowne was later part of the peacekeeping force along the Demilitarized Zone. Unfortunately, Liteyo was lost in a Borg attack. Escaflowne immediately requested a transfer to search for his cousin, believing him to be still alive. However, the Dominion War changed those plans, as Escaflowne was re-assigned to the USS Ark under Captain Faye Valentine to patrol Bajor space. During the War, certain influential parties of the Obsidian Order and Tal Shiar were involved in recurring but unsanctioned partnerships of mutual benefits. The USS Ark came upon such a meeting at a trade outpost, but Captain Valentine was murdered after transporting over to investigate. Suddenly, the Ark was quickly overwhelmed by Obsidian Order and Tal Shiar warships, leaving only a handful of survivors. As command officers fell one by one, Escaflowne took command of the USS Ark and fought her way to freedom. He was promoted to Lieutenant for his gallant escape and survived to report the meetings. As he recovered in the hospital, Escaflowne learnt the awful truth of the diplomatically challenged Federation. The UFP willingly covered up the Ark incident to prevent jeopardising a potential alliance with the Romulans during the War. Disgusted, Escaflowne left Starfleet during wartime conditions, using his royalty background as immunity from being charged for desertion. He spent the remaining of the War searching for Liteyo. Fortunately, his perseverance paid off, as only Escaflowne was able to recognize an unique distress transmission that he and Liteyo developed as codes during their childhood. Liteyo had retained his sanity due to the robust physique of the Berjanni against pain and secretly broadcasted the transmission without the Borg’s knowledge. Just before the end of the War, Escaflowne finally rescued Liteyo along with a Borg scout vessel intact for valuable research. Escaflowne was appropriately promoted to Lieutenant Commander and awarded the Medal of Distinguished Service despite the fact he actually deserted Starfleet. As Liteyo readjusted to life in Starfleet again, Escaflowne returned to active duty, participating in the final decisive battle of the War to secure Cardassia Prime. Sometime later, Escaflowne came across reports relating to the Obsidian Order and Tal Shiar operatives who brutally murdered Captain Valentine and attacked the Ark. Denied permission to investigate and maintain the cover up, the angered Escaflowne went AWOL again and sought company with the Orion Syndicate and Yridian Cartel. After several years of intelligence gathering and training with Orion bounty hunters, Escaflowne methodically hunted down the guilty operatives, those who resisted he silenced permanently. Once completing his grim task of vengeance, Escaflowne surrendered himself to Starfleet. However, certain members of the admiralty relished in private of Escaflowne’s efforts in ridding the unsavory operatives. In addition to being a brilliant officer, despite past disciplinary problems, he was a royalty of Berjan. Thus, they protected him and reduced his court martial punishment to only a simple demotion to Lieutenant. Escaflowne was then immediately reassigned to BravoFleet to encourage his outstanding research and development of advance offensive and defensive technologies. Escaflowne served prominently onboard the now legendary USS Peacemaker-C while in BravoFleet. Under the leadership of Admiral Pike, the Peacemaker became the most successful flagship in the fleet. Unfortunately, the Arcadia Incident set a huge blemish on that track record when during a routine visit to the Arcadia Relay Station, it appeared both the station and the Peacemaker were destroyed by an unknown probe. A sabotage was suspected by one of her own crew, leading to a wide scale conspiracy. In truth, the Peacemaker was accidentally transported to the uncharted galaxy of the Magellan Clouds by an advanced alien race. So began a long voyage for home for the lost crew of the Peacemaker akin to the journey of the USS Voyager. Towards the end of their adventure, the Peacemaker encountered a Borg cube invading a friendly Tau colony. According to Tau prophecy, Escaflowne was destined to be the hero to save the colony from the bio-mechanical threat. Although Admiral Pike refused to allow his chief engineer to sacrifise himself, Escaflowne defied orders and destroyed the Borg cube at the cost of his own life. Fortuantely, members of the royal Berjan family somtimes inherit an unique ability very similar to the Vulcan's Fal-Tor-Pan. Escaflowne was able to "cheat the grave" by implanting his katra, essentially his living essence or spirit, into a a crystal via a form of mind-meld just prior to death. The crystal orb was kept safely in the hands of Counselor Jaelen, Pike's wife, unknown to her knowledge. Katras can, on rare occasions, be returned to the body, effectively bringing an individual back from the dead. Counselor Jaelen eventually discovered that Escaflowne's spirit was stored in the crystal orb by her side all the time. Immediately after the intergalactic jump to the Magellan Clouds, the chief medical officer made prudent steps to obtain clean fresh DNA samples of every crew. If any of the crew were to fall victim to an alien sickness, the medical team will be able to make vital observations as compared to a healthy cellular version of the person. In Escaflowne's case, the DNA sample was used by a Tau high priestess to performed a ritual which removed the katra from the crystal orb and implanted it into a body regenerated from the DNA tissue. The technology used to regenerate a compatible body with similar features to the original was so advance, the chief medical officer could only describe it simply as a clone. Subsequently, Escaflowne recovered, although it took some time to retrain his mind to the point where it was prior to his death. He had that luxury upon the Peacemaker's return to Earth, when the crew were subjected to months of debriefing and tests. Eventually, Escaflowne's original memories apparently reasserted themselves and he resumed his duties in Starfleet.